Some years back I wrote a small program to add roads to terrain maps. At the time, Bryce was my main 3D program, so most of the testing was done using Bryce. Although it worked, I was never happy with the quality of the road textures because of pixelation. The cut and fill areas also shared the same texture as the main terrain, which is OK in some circumstances but not others. This image shows the quality problem. Over the past few months I started to work on an updated version that uses the terrain map to create a road, but outputs all as an .obj mesh. 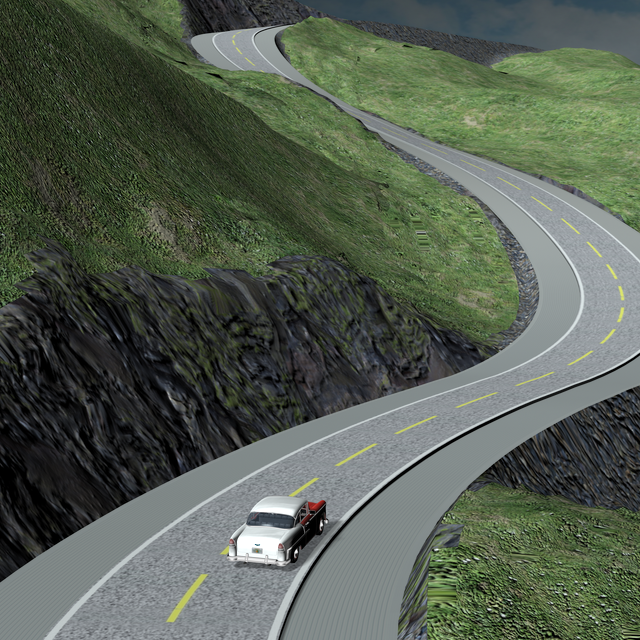 By doing that, I can use UV mapping for the road texture and create separate material zones for the roadbed, curbs, shoulder, cut, fill and main terrain to allow a greater variety of textures and better quality. 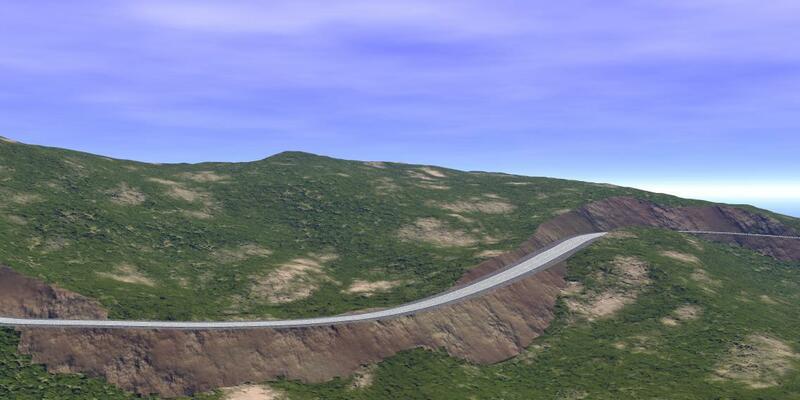 Becuase it is a mesh, it also allows steeper roads to be made without the staircasing you get with a terrain map. This image shows the progress. OMG I would not drive a car on those roads. i think what you do is pretty cool but given real world road gradients and physics some of those climbs would be impossible. RGcincy - extremely interesting work you're doing. Adding roads to a terrain is very tricky. If it is part of the terrain, you get the problem with the material. If you create them separate, you have the material issue mostly out of the way but run into problems how the road follows the terrain contour. Below, the first one I made by drawing the road into the TE and fiddle with the material. The second is based on a terrain made in an external program where I could draw the road as a vector and define how the road follows the terrain and when it cuts into it. The process is mostly hit and miss and you're back at the material problem. So I'm watching this space. Your roads cut into the terrain as most do Horo, forming an embankment. 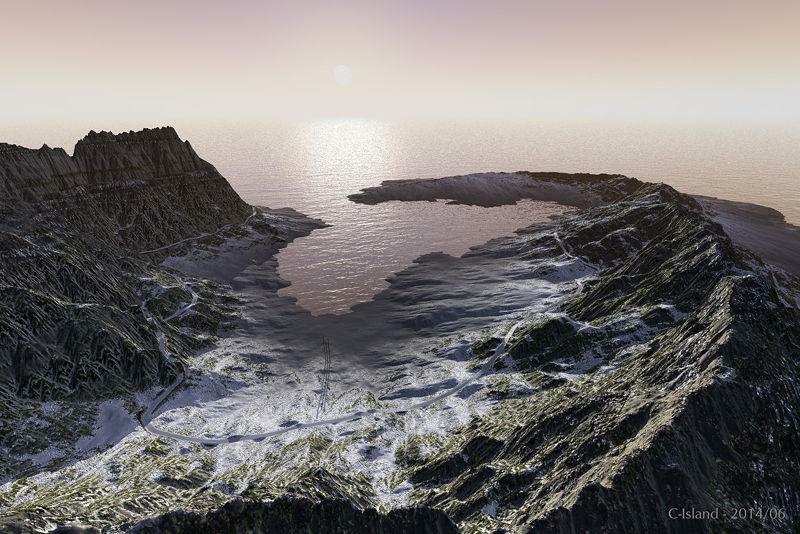 I am a Carrara user as you know but we both use the same greyscale height map system for our terrains so a common topic, I have looked at BJcincy's program. JaguarElla - I fully agree. Real roads are on the surface, cut into the surface, are bridged over chasms, disappear in tunnels. Roads are a real challenge. At this point I'm not entirely sure I can work out all the issues but keep trying. That's why I focus on the ones that might make or break the approach. For example, roads have crowns to allow water to drain to the side. My current version makes a totally flat road, but crowning will be easy to add as it uses the same coding that already creates the roadbed, shoulders and cut and fill. Same for drainage ditches, gutters, and better curbs. Roads also bank on curves and right now mine don't, but I expect that is relatively easy to add based on the geometry the program already knows. Right now cut and fills have the same slope; in real life, that varies by rock type (hard rock have more vertical cuts while shale requires a very gradual cut). That too should be easy to add. The fill textures need some work. The program determines if the slope has changed enough to change textures. Right now on one side of the road the texture ends too late (so the terrain has cut texture) while on the other side part of the cut has a blocky terrain texture. I have some ideas on how to correct but need to test them. The biggest issue I'm working on is terrain and road fit, I've made a lot of progress but still get artifacts (like terrain poking through the roadbed or cut and fill areas). We'll see what happens. Here's a flatter road. Much more cut and fill gets added. 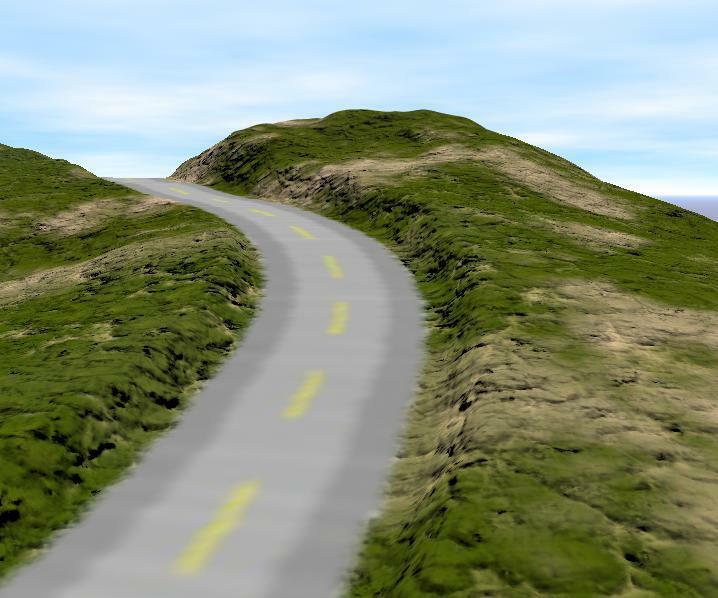 It took 22 seconds to load the terrain map, add a road with 6 dots, then generate the mesh. Takes about 5 minutes to import the mesh into Bryce and add the textures. Wow, this looks very promising. As indicated by Horo, roads are certainly difficult. But your process looks to be very good, when finished! Thank you for all the models and the whole ShapeMagic package! The only object that is leading to a 'not found' page is the Hot tub model to be used to follow the tutorial. Sorry for slow response, I wasn't getting notifications for this thread. Glad you can make use of Shape Magic! And thanks for letting me know about the broken link. Looks like I forgot to upload the zip to the server but it's now fixed. After a 3 year hiatus, I decided to take a fresh look at my road generating program. 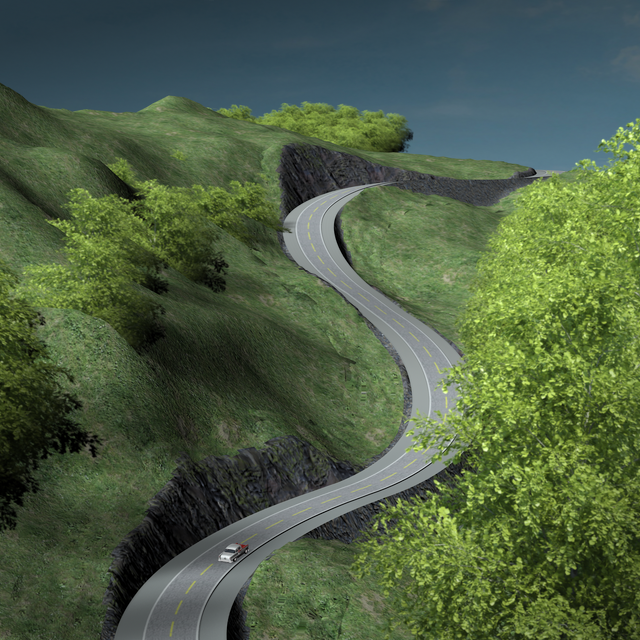 The biggest problem I faced before was getting the road terrain to smoothly mesh with the underlying terrain. After testing a bunch of mathematical approaches this week, I made substantial progress. There are still some areas with gaps but they are far fewer than before. I also corrected a UV mismatch between the two which made for misaligned textures. These test scenes were done in Daz Studio, but since it's an .obj mesh, it imports fine into Bryce as I've shown in prior postings. There's still several roadbed issues to be tracked down and resolved but my biggest stumbling block was the terrain matchup. Very interesting. I knew Shape Magic but missed the roadmaker. I applause your effort in making this program. Bravo! 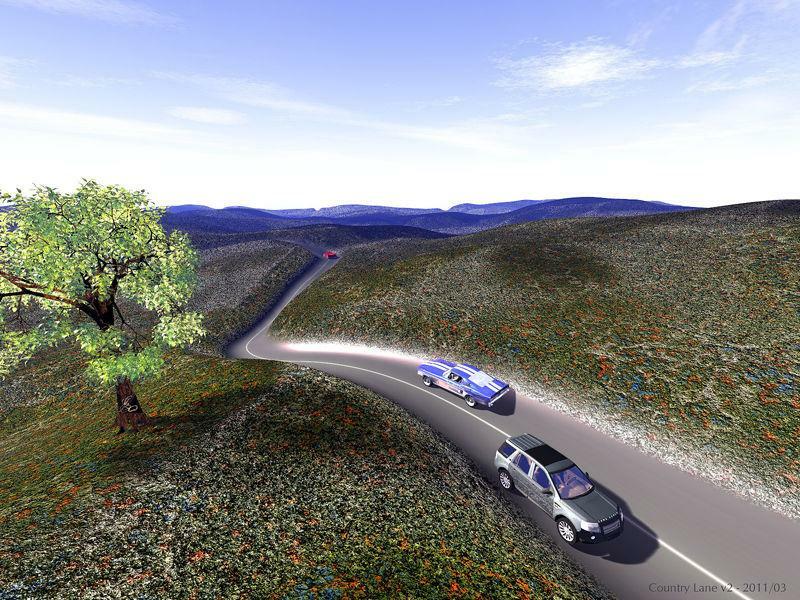 This is a nice project to improve roads on terrains with Bryce. has it really been that long? sigh - time is just flying - felt like that thread was active just last month... wow. but, for your updates, bravo again! This is a serious win! I know, I'm having to spend time digging through the code to remember what all I did (I'm not the best at documenting all the logic). I'm next looking at adding a new feature, banking the road on the curves. Conceptually simple but a change that affects most all the equations. Very cool, Rich...if it is of any consolation, work so is proving excellent (or should that be, looks on track - sorry, horrible pun, isn't meant as condescending). RGcincy - you made progress, do keep it up. It's been 11 years since I looked at the base code but I think the authoring system limited the size of a window to the screen resolution (which may be why you get the white area as it would cut off the map). The program may also be limited to addressing only 2GB of RAM memory, which means a large map (which gets duplicated multiple times for the different texture maps) may just run out of memory..